It's hard to imagine that things could have gotten better. After dinner we gathered in front of the small, but warm, fire. I slouched in a leather chair. Amy beside me in her chair, Carol F, backed up to the ottoman in front of me. Laura sat near Amy, Leeanne and Louise shared the couch. Carol O. sat center stage on the hearth. As the founder and facilitator of Chat Noir Writers Circle, she could have shone like the sun, while we, her planets circled around her. Instead, she sat among us, an equal and leader at the same time. Her brightness enhanced by the light of her friends. Hard to pull off, but not for Carol. Our last night together began with Leeanne, Laura, Amy and both Carol's sharing their vision boards. It was amazing to see how board reflected its maker's beauty. We noticed how Leeanne's favorite color turquoise, stood out among the pictures and words she chose. A surprise even to Carol F, was how instead of travel, her board spoke of her love of dance. Laura's board identified her desire to be more courageous and bold. I couldn't miss the quotes were soft and gentle, yet powerful, like the woman who chose them. " joy is 1 part inner pece 1 part giddy delight and 100% attainable" or "the soul is here for our own joy" (rumi). Carol O's board pictured a layering of doors. Each opening as if to call her in to a new place. I didn't have a board to share. I read some of this blog about how the experience had opened me up when I didn't even know I'd been so tightly shut down. If this week had been a movie, the final scene would be each of the women reading their favorite piece of work. The words were awesome. Powerful. Touching. Hearing them read by the artist who wrote them incomparable. It's been a long time since I sat in a circle being read to. I think it was nursery school in Philadelphia. I can remember lying next to my mother for an afternoon nap, dozing off as she read me a story. The child in me was comforted by this firelit circle of women and stories. The writer in me wanted more, and more, and more. Like all good things, the evening had to come to an end. "Will you go in the hot tub with us?" Laura whispered in my ear. Still aglow from the evening's readings and warmth of the fire, I said, "sure." It would be a perfect end to a perfect week. Simmering in hot water with Amy, Laura and Carol brought out even more flavor from the week, like cooking a beef bone makes a meatier broth than opening up a can before adding it to the soup. The end product is so much better than the individual ingredients. The conversation(s) were raw but honest. One of us has a brother who could best be described as an #%AA#, one has a few mother issues, one is in a constant battle with her son. Yet each of us believes in the power of forgiveness and moving on, in finding a place of serenity that includes troublesome loved ones. Although painful family dynamics can make for a good story, staying stuck in them zaps writers of their creative edge. Disabled Amy (I don't think she'd mind me saying that) maneuvered in and out of the roiling water better than I did. Bubbles filled my bathing suit so that I felt like one of those channel buoys ships use as a guide. I had trouble sitting still. It's been 20 years or more since I've been in a hot tub. Without estrogen flowing through my body helping me maintain a constant livable temperature, I've grown into a woman that can't stand much heat (literally and metaphorically). I must say, however, my back screamed an orgasmic, "oh God" as my muscles began to relax. The clock's hands passed midnight, then one, then two. Knowing we'd have to get up in just a few hours, we stood up on wobbly legs and made our way to our separate bedrooms. (Amy, of course, didn't stand. But she did hoist herself out of the hot tub, with way more strength than I did.) Before falling asleep, my down time consisted of re-counting sweet memories rather than sheep. And just like that, as if Cinderella's coach had turned back into a pumpkin, the magic faded. Pollen-laden worker bees we turned our thoughts toward home. Saturated with the glories of the week's experiences, our casual laid-back personas morphed easily into those of the job-focused women we are in the "real" world. Our pace quickened as the time for departure neared. The hustle and bustle of packing, cleaning, loading cars and getting Amy down the steep ramp over-shadowed the mountain's stillness. We paused only once, for a final photo shoot. We let Cherish Rose, the youngest of the group, yet every bit as wise and witty as her mother, position us for the best light. "Chats!" we chimed in unison. Knowing that one picture could not capture the spirit of the whole week, we smiled over and over again, as cameras clicked. Standing on that balcony, with the mountains as a backdrop evergreen trees moving on the tiniest of currents appeared to be waving goodbye. The bird songs bid us a fond farewell. As must happen when the final goodbyes are said, the solemnity of the moment breaks. Louise began singing, "Memories" from her favorite musical Cats. Not to be outdone, Cherish, Laura, Carol and Amy marched down the hallway singing "Do You Hear the People Singing"from Les Miserable. A perfect end to a perfect week. I thought it might be easier to pack the car for the trip home. Let's face it, a wheelchair in the back of a Ford Focus is going to be hard to pack around no matter what. It's the stuff of a Mike Rowe commercial. Our first stop (requiring an unpacking to get the wheelchair out, and repacking to get it back in) was Mercier Orchards. On top of the chair went 5 bags of apples, a few jars of preserves and apple butter and a bottle of sparkling apple cider. While at the orchard store, Amy and I watched how apples are handled from the time they are picked til the time they are packed and shipped. First they go in a dunking tank, and roll out on a conveyor belt. They are sprayed to look pretty, then the bad ones (remember the one bad apple adage) are culled by women sitting on either side of the belt. Then the best of the best are packaged for grocery stores, the others bagged for sale there at the orchard. Although it was a mechanized belt that moved things along, I was surprised to see human beings doing the work, not robots. The work did not look stimulating. I'm glad I'm not an apple picker-outer. But I will appreciate the apples in Publix a lot more knowing they were touched by people who do a job that's been around since Johnny Appleseed. What if those women sent a blessing, like a prayer with each apple? Maybe that's what makes those September Wonders taste so good. Or could it be the bees? Jim Mercier explained to me that even when something says it's organic, some pesticides have to be used or there would be no pollination - no fruit. A local bee keeper brings his bees into the orchard at the right time of the year for population. He only has a 3 day window, and the temperature has to be below 60 degrees. I had no idea Mother Nature had such an exact schedule. The bees arrive at night, feeling angry and out of sorts. I wouldn't like my home being smoked, put on a truck and carted away either. They need to settle down some. They stay in the hive while it's dark. In the morning, they circle the area 3 times to get their bearings. Then, like fraternity brothers at a keg party, they fly into the orchard dipping their heads and feet into the heady, goodness apple blossoms provide. At the end of the three days they return to their hive, where the work of making honey begins. Interesting. Our second stop, the De Kalb Farmer's Market in Decatur, Georgia. Think a couple football fields full of every kind of food imaginable. Seriously, I'm talking anything and everything. Sustenance for the job ahead required a trip through the buffet line. Then it was down to business. Carol bought for herself and her daughter back home. Amy had cheese, bread and wine on her mind. I felt overwhelmed. I didn't know where to start but knew if I did, stopping would be a problem. I strolled behind Amy. I tried not to drool over the pastries, chocolates, fresh strawberries, chocolate croissants ........ This proved to be a good thing. After all the grocery bags were stuffed in the few open spots left, my back seat felt mighty cramped. From Decatur/Atlanta we only stopped once. Amy insists that people are friendlier in Georgia. I cannot disprove that theory as everyone I met all week, spoke and smiled and displayed good ol' southern hospitality. We chose to stop at McDonald's over the few gas stations we saw. Good choice. New, clean, friendly, helpful personnel. Sometimes the Mickey D's experience can be less than desirable. This was not. Sustained by caffeine, chocolate and french fries, we faced the rest of the drive home contented. I've got to say God bless Carol O'Dell. I'm not kidding folks, she is one amazing woman. She can write. She can cook. She could read a road map and keep you on the edge of your seat. Although big hairy psider removal requires an extra set of hands, she does not blink before sticking her hand into a toilet's plumbing apparatus. She hugs like a mama, encourages stretching your muscles (physical, spiritual, emotional) like a coach, cooks like an Iron Chef, and drives like a multi-tasking trucker on a long haul. She is a great listener and wonderful to listen to. I called her Wonder Woman more than once on this trip. Sweetie and Suzi Q picked me up at Amy's house around 10pm -twelve hours and a world away from where I'd been. A balmy sea breeze replaced the mountain air. Within minutes of walking in the back door, i had slipped back into my every-day skin. I wandered around the house looking for the changes Sweetie had made. Give that man a few hours by himself, and you can expect something to be rearranged. Not big differences. Subtle changes that you can live with but startle you when first encountered. Like moving the bread box from the counter by the refrigerator (where it has been for as long as I can remember) to the counter by the toaster. I'm happy to say the house had been well tended to - always a nice to come home to. I felt a wee bit off kilter this morning. The dog barking woke me up, not women laughing. I looked for my peeps and they weren't here. I looked for a place of solitude, a hideaway for writing, it's not here. I decided not to rush right back into things. I gave myself time for the transition. Sweetie has turned off the air and opened all windows and doors. I believe the birds are louder here than in Georgia. Boy Cat sits at the door, watching. Hoping a squirrel or lizard may get close. In the same way, the outdoor sounds quiet me. Like Grandmother's chair that I'm sitting in, my old routine is not a bad thing, it's just a little worn. On the other hand, its comfort reminds me how lucky I am to have a place to call home. I feel like a bee who has gone from one flower to another collecting succulant bits of life. I've traveled in a group and I've soared to a place I, alone, needed to be. Now it's time to pollinate the thing I love. To write. You know the sound of a 1000 bees humming? Imagine the stories they tell. I am the woman who felt so anxious, nervous, scared she almost backed out of going on this retreat. Now I'm the woman who can't wait for next October so I can go again. It won't be the same, but I don't want a do-over. Instead, I look forward to something new, like a person who has been baptized in the jacuzzi of life. I hope I won't soon forget the pleasure of opening up to the "yes." So basically I listened, interjecting a name or a title on occasion. But here's what I learned. When you are with fun, witty, intelligent women who find meaning and inspiration in just about everything in their lives, listening is okay. The beautiful community of women can be as much about listening as joining in. Of course I don't remember the really poignant moments when Carol had me sitting on the edge of my seat soaking up her wisdom as if sitting at the foot of the Dali Lama. It would be nice if I could, but just being part of the group was where the magic resided. I've heard of women's groups that dance naked under a full moon. I've seen pictures of women holding hands at sunset walking into the ocean for a communal baptism. I've attended women's prayer circles. I've been to Cursillo. I grew up in a house full of women, for God's sake. But even standing on the outside looking in, I've never felt more a part of any group. Yesterday afternoon (after Donnie left and I'd recovered from being lost in plain sight) most of the gang searched through magazines for words and pictures to use on a vision board. The first step in this process is choosing a word for yourself. A word that you want to focus on, or want more of, or want to incorporate into your life. It could be an emotional word - strong, courageous, bold. It could be a desire - relationship, travel, learn to cook, whatever. Then you go about choosing pictures that speak to you. Carol said they don't have to be about your word (printed on the top of the poster board). Just pick and cut and move on. Next, you glue the pictures on the board, collage style. In the end your word will become a visual reminder of what your goal is. I can't say why, but I wasn't feeling it. I'm sure I've got words I need to hold on to - goals, self-esteem, confidence. Not of them spoke to my heart so I chose not to participate. I scanned a few magazines. Tore out a few pictures that spoke to me. Mostly I watched the others. And listened as they encouraged each other and laughed and told stories about themselves. It didn't feel like eavesdropping, in the typical doctor's office way, where you can learn anothers whole medical history by pretending to read an out of date Newsweek magazine. This felt more like i was absorbing the scene, like the towels soaking up spilled wine. I haven't tried to analyze the why of my actions. I'm okay with doing what's comfortable in the moment. It is now almost 2pm on day three. Our last day here. There is a subtle finishing up of this place and gearing up for the next taking place. As I expected, as anxious as I was about coming, now I don't want to leave. I want more time here. I want more time with my peeps. I want to be surrounded by mountains and trees and laughter and wisdom. I'd be the first to admit I'd be lost without the finer things in life. This computer, for instance, the indoor plumbing, cold Cokes, good food I didn't have to shoot and skin myself, and even my smart phone. I wonder, however, if what I'm feeling - this whole woman community thing - is buried deep in my cells. Could it be DNA left over from a time when women sat around a fire sharing stories of their past and visions of their tomorrows, painting ochre pictures of prehistoric moose on cave walls, complaining about how hairy their Sweeties are, and basking in the warmth of friendship? I'm reminded of the song my Internet friend, muse, and grief counselor, Dani Sutliff first shared with me. It fits how I'm feeling this week. Heal me now, together we heal each other In a circle of woman, I am whole! "I'm ready to take a nap or go for a walk,"said Carol F.
My eye lids were resting at half-staff. I really wanted a short snooze. But I wanted to walk outside more. So I grabbed my sneakers and sweatshirt and headed out. Down the hill we went. Two women in their 60's who are not quite as athletic as the rest of the group. A walk after dinner is about all we manage at home. Perhaps mountain climbing should not have been our first choice. I took note of the Beware of Dog sign, but after that kept focused on walking at a downwards slant without going head over heels. The weeds, Carol pointed out, are the only green things changing color. I admired the Queen Anne's lace and rock cairns on the side of the road as we talked. It was not long before we came to the realization that a) going downhill means an uphill walk home which could prove problematic, and b)nothing looked familiar. Note to self: most gravel driveways and log cabins look alike on the outside. Dropping bread crumbs might have been prudent. But I really didn't worry because I knew we were only one driveway away from the Beware of Dog sign. All we had to do was spy it and we would be home free. I soon discsovered the sign wasn't where I thought it would be. As we pondered the proverbial fork in the road, the AAA truck which was coming to our cabin to fix a flat tire that Leeanne had luckily spotted before headed home came rumbling up the hill. "Is this where I turn?" asked Donnie in a thick Georgia accent, hopping down from his truck like it wasn't three feet off the ground. If he thought the sight of us wondering like lost dogs, he didn't say so. Yes, Amy, people are friendlier in Georgia. "Well yes," Carol and I answered in unison sounding much more sure of our surroundings than we felt. "Well, maybe." "The directions say turn at Sky Something Road, so this must be it," said Donnie. "The lady on the phone gave my dispatcher these directions." "Yes we're with that lady, so you can just follow us. Let's turn here." With Carol on one side of the road and me on the other (still looking for the only landmark I'd recognize) the Red AAA truck moved slowly up the gravel road. We didn't go far before we reached another fork in the road. Each driveway leading to a dead end. Each going uphill. I did not have the sense that we had not ventured this faraway from our home away from home, but was no longer able to say from which direction we had come. "I'll call Laura," I said. Donnie used Carol's phone to call Leeanne, who was standing on the porch watching for the truck, like a 17th century whaler's wife. Laura's line was busy, so I left an "we're lost" SOS and headed back to the first fork. Part of me wanted to cry like a little girl. Another part wanted laugh like a crazy woman. Because really, it's kind of ludicrous that we were so lost. In the meantime Donnie was having a conversation with Laura, our own GPS Siri. "These ladies are really lost," he told her. I can bring 'em back with me, if that's okay. Laura assured him that we were location-challenged but quite harmless otherwise. It would be fine to let us in his truck. So Donnie backed down to a turn in the road (where he should have gone straight before) then stopped to let us in. "Y'all be careful of that step," he warned. Good God, I thought to myself, when I saw how high it was. Up a little ways, and around a bend, the Beware of Dog sign appeared. And then, up ahead, there it was. Home. Like Dorothy finding herself back at Aunty Em's house after her trip to Oz, I felt relieved and wondered if the trip really happened. The thing about being a writer is every adventure can be turned into a story. I mean, what are the chances of getting lost after 2 turns and being rescued by clean-cut, polite, slow talking Donnie in a Duck Dynasty T-shirt. That kind of stuff is hard to make up. The day almost started tragically. If I tell you there are 14 stairs between my bed and the bathroom can you guess that it is a rather risky walk at 5:30 in the morning. I did fine until I missed the last step. Had I not been holding on, I would have landed face down on the wooden floor, looking like one of those bear rugs - or moose - or person as the case may be. The good news is I did my business and made it back upstairs without incident. More awake than I wanted to be at that hour, I kept running stair-falling scenarios through my head. I have a vivid imagination when left alone to think my own thoughts. At the more civilized hour of 9:30 I awoke to Louise saying, "Oh look!" I sat straight up, thinking there may actually be a moose on the porch or something else as incredible. "What?" I yelled over the banister. "It's raining," she exclaimed. "I love the rain." Thinking about it, the sight and sound of the rain was pretty incredible. I could see no sign of the mountains, just gray mist. For most of the morning, the mountaintops played peek-a-boo in and out of the cloud cover. I think I've seen too many western movies. Right now it looks as if there are smoke signals rising between the ridges. After a good night's sleep, most of the Chats were up and working on their computers when I mosied downstairs. Well, working may be stretching it a bit. Computers were on, books open. The kitchen counters full of various breakfast foods, from Quinoa to leftover lasagna provided ample foraging opportunities. While this is a writing retreat, I've noticed that there is a lot of talk about spirituality. I think the mountains and trees and fresh air and unpaved roads must bring that out. For me being surrounded by nature is a form of spiritual revitalization. Dictionary.com defines retreat as: The act or process of withdrawing, especially from something hazardous, formidable, or unpleasant. Withdrawing from the world's busy-ness (yes, I know we're still technically connected) and settling into a more natural rhythm of life is what this time away is to me. It may take longer than 3 days to completely unwind, but it's a start. The conversation turned to the advantages of "letting go" (not an uncommon theme for me). Whether its decluttering your house, your relationships, or thoughts that no longer serve you, you are making room for something new. Letting go, every action is a prayer. With that thought in mind, I opened up my daily word from Gratefulness, here's what it said. Synchronicity? Coincidence? Or the Divine giving a nod to the journey we've embarked on? When was the last time you turned away from your computer and cell phone, and relaxed into some quiet moments of gratitude? What part of your life do you want to let go of? Why not try it. Part of Caroline's nap routine includes down time. Ten or 15 minutes before she goes to bed I start getting her used to the idea of going to sleep. I hold her close and read a story or two, then hum a few verses of "Hush Little Baby ..."One of the books I read is Goodnight Moon. The hum of the ceiling fan is like a hypnotist's voice. "You are getting very sleepy." I notice that the house has a kind of "down time" of it's own. The lights have been turned off. The wood creaks a little. Everyone is tucked in. I feel like saying good night. P.S. Good night Sweetie. I love you more than all the wood and moose stuff in this cabin. P.S.S. It's just started raining. Rain pouring down. What a glorious sound when I'm tucked in all comfy and snug. Maybe I should call it Day 2. Just getting here, to Blue Ridge, GA, was an adventure in and of itself. 3 women, a wheelchair, enough food to keep us going for weeks, if caught in some kind of natural disaster, water, coke, tea, Red Bull, art supplies, blankets, pillows, clothes, computers and 2 bottles of Absinthe at my feet. It was touch and go whether we'd even leave Jacksonville. But 8 hours, 3 stops - which included unpacking the car in order to get the wheelchair in and out of the Ford Focus - we pulled into the steep driveway of a wooden cabin hidden in north Georgia mountains. My writers group, Chat Noir, is on retreat for three days. Retreat, I'm learning, means different things to each of us. There is writing to be done, for sure. But mostly we're here to unwind, to soak up the serenity provided by the cabin's seclusion, to refuel our creative tanks. I'm pretty sure drinking and laughing are at the top of the to-do list. When I say cabin in the woods, you are probably thinking small, rustic, creaky, perhaps a little smokey or stale. Well, think again. This place is the largest cabin I've ever seen. Think castle in the woods. Three floors with bedrooms galore. Enough bathrooms for 8 women, kitchen counters laden with food stuffs for vegans to meat eaters and everything in between, an espresso machine, a crock pot, and a plethora of potent potables. I'm staying in a loft, sleeping in a bed that could be exactly what the doctor ordered what the doctor should have ordered for my back. I awoke this morning to the sound of women laughing. When I opened my eyes, I looked across the room, through A-framed windows. Through the trees I could see the mist rising over the mountains. Torn between more sleep and curiosity, I crept downstairs to see what was going on. Leeanne and Carol F. huddled around Amy's bed recounting their drive through small Georgia towns yesterday. Remember, these are writers I'm with. Southern writers whose genteel conversations, peppered with unexpected curse words, flow like sweet, iced tea on at a garden party. These are the ladies I think of when I hear the term steel magnolias. I've known them long enough to know their tales are born of hard times and heartache, yet humor resounds in every narrative. The last retreat, (as if there are many) I took was back in January of 2007, when I began writing this blog. I needed a break from the rigors of caring for my Dad. I may have become a hermit in the intervening years. I had way too much difficulty saying yes to an opportunity to spend time with some of my favorite people, doing one of my favorite things. "Do you have a sense of foreboding," Sweetie asked when he saw my hands shake. I couldn't define my anxiety. Just knew it was there, in the pit of my stomach. Every jangled nerve relaxed as I settled into my tiny space in the back seat and the journey began. So I'm here to relax. To spend time in a place where bird songs and a slight breeze sends autumn colored leaves dancing to the ground. To retreat from the busy-ness and weary-ness of the world. To submit to the silence. And when I feel myself on the brink of going stir crazy, I only have to walk from one wood paneled room to delight in the community of women. Wishing for you time to slow down. PS My camera is broken and I don't know how to get pictures from my "smart" phone to my computer. each day for the abundance that exists in your life. the more you have and are grateful for, the more will be given you. After reading an email that touched my heart this morning, I began to feel overwhelmed with all the things I have on my plate. Not the kind of things I want to ignore, like dusting and weeding. Things That make me feel all atwitter inside. Things that make me weep tears of joy for me and tears of sadness for others. I did not "consciously giving thanks each day for the abundance in my life," but Sweetie did. Every night before dinner, he says this grace over our often blah repast." Well, thanks God for our many blessings. Be with us in all we do. Guide us in all we undertake. I'm happy to say God responded to the "us" in that prayer and has covered me in abundance. I've got stories to write. Bears to make. Babies to care for. I couldn't ask for more. And it took a full eight minutes of rejoicing in my abundance before the the doubts about my capability to do it all set in. In typical Merry Me fashion, I'm about to freak out with all I have to do. Believe it or not, this is improvement. Before I get all caught up in the can'ts I'm going to say TTFN (ta ta for now) and get to sewing. A guest at our annual Chat Noir Extravaganza a few years ago, told me I remind her of Erma Bombeck. Seriously? Me? I think I stopped listening after that, imagining myself in the same humor stratosphere as Erma made me dizzy. Not to mention a bit puffed up. I just read an article from The Erma Bombeck Writer's Worshop by Polly Scott*. In the article the author lists 5 ways to write a funny blog post. Sadly, I'll have to change my whole style of writing if I am to follow Ms Scott's rules. First she suggests keeping posts under 300 words. Dang. I'm just getting started at 300 words. And she says to use short, choppy sentences. Come on folks, I've never met a run-on sentence I didn't like and want to bring home to dinner. And one-sentence paragraphs? What's up with that? I'm all for learning new things, but the truth is I like my way of doing things better. Guess I've got a long way to go to be in the Erma Bombeck league. That said, I'm going to keep this post short (short being a relative term). Mainly because I'm not going to write it. Instead I'm going to send you over to my friend Illuminary's blog. Sorrow and I have become "Cohorts in Cahoots" and made 3 three quilts for the soul purpose of giving them away to worthy people/causes. I must say, I love being She of Many Names' Cohort. 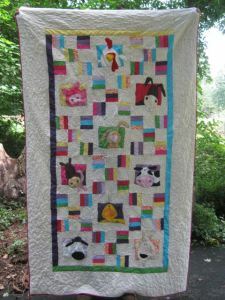 Please check out her recent post that tells about the Poplar Spring Animal Sanctuary fundraiser where our whimsical barnyard quilt will be up for auction. We're rapidly approaching that time of year when lots of people and worthy causes will have their hands out asking for donations. You alone have to make the decisions about where and who you give your hard-earned dollars to. I think if you check out the PSAS, you'll see why Sorrow and I offered to help them out. Please read Illuminary's post. You'll be glad you did. *Inspired by the 2012 Erma Bombeck Writers’ Workshop, Polly Scott wrote and published a book, Forget About Grammar: How to Write a Better Blog Post. She teaches an online writing course and writes a humor blog, Coming to Grips. I've felt like crying for most of the day. A few tears have leaked out, but mostly I've just had that feeling I get when the flood gates are about to be opened and I'm not sure if they will ever close. I wanted to cried around midnight when I called Weneki to say happy birthday. She wasn't home, so I left a birthday song on her voice mail. I usually cry on Weneki's birthday. I cry joyful tears at the memory of the day she was born. I cry missing her tears. I cry tears of pride when I think of all she's been through in her lifetime, and how, even when it hasn't been easy, she's risen to the top like sweet cream on fresh milk. I wanted to cry as 64 year old Diane Nyad climbed out of the water after swimming 103 miles from Cuba to Key West. Not so much for her success, but for the her triumph after several failures. All those "not this times" spurred her on and made her try that much harder. Truth be told, I felt like crying because I've never let myself dream large dreams. I don't even know what I'd dream if I took of my I can't filter. I felt angry tears welling up when I asked my son a seemingly (to me) simple question and got attitude and a answer one might give a 2 year old who's just asked the same question 50 times - slowly, mouthing every syllable. Then when Sweetie asked me a seemingly simple question I barked at him. I hate it when I do that and it made me want to cry remorseful tears. Tears of frustration welled up when I began a sewing project and there was just not enough fabric, no matter how I laid the pieces out. I'm making stuffed animals for a good friend whose husband died recently. I get sad every time I think of her life without him. But I love seeing his favorite clothes being turned into something kids can cuddle when they think of their grandpa. I really do not want to screw this project up. My heart felt heavy and tears began to trickle down my face as I listened to news reports of the possibility of military action in Syria. Oh God, not again, I cried. After all those near boo hoo fests, the words to an Alabama song, hit me hardest: She had her freedom, but she'd rather be bound to a man who wouldn't let her down. I remember a time in my life when that's all I wanted, a man who wouldn't let me down. I'm lucky to have found one I trust to be here with and for me. It breaks my heart to be told that's not enough. Sometimes I just feel weepy. Good thing I've learned that my tears, like afternoon rain showers in Florida, are to be expected. They come. They wash away the ick, cleanse my soul and leave little pear shaped prisms of color to see through. “There is an ancient tribal proverb I once heard in India. I knew where babies came from but had limited knowledge of how they are born. "I think something's happening down there," I said to no one in particular. Shortly thereafter, my plump-cheeked, bald-headed baby girl was born. That baby has grown into a woman I'm proud to call daughter. She is beautiful, wise, and witty. She adores the color green, crows, movies, and books. She has never met a quilt she didn't like. She eats beets, drinks Kentucky bourbon, and makes a mean guacamole. She loves deeply and dislikes mean people. She has a warm spot in her heart for furry four-legged creatures, a good pen, Las Vegas, and John Denver songs. She is a Tough Mudder, swims like a fish, dances when the mood hits and takes naps. She is a sister, wife, niece, cousin, friend, manager, co-worker extraordinaire. I think it should be against the law that mothers do not live close enough to their children so they can celebrate birthdays together. But until that happens, I have to rely on the US Postal System, AT& T and Apple computers to let her know how much I love her. Have a happy day, my sweet girl. May the year ahead be filled with all your favorite things. Your mother loves you more than anything you can think of times 100. When Dad was alive we rarely missed going to church. Even toward the end when he couldn't make it, I'd go. I'd sit in the front row, right next to the place reserved for him. [It wasn't really reserved, but pretty much everyone agreed it was Dad's seat.] Sometime in the last two and a half years I moved to the back. There was no particular reason, I just moved. You get a whole different perspective of church from the back. You can slip in late and no one notices except Delores who stands at the door handing out bulletins and smile. I suppose you can sleep if you want, without catching the preacher's eye. And you can raise your hands in praise without others seeing you. That's not as big a problem as it once was. Before the Hispanics came, our Episcopal church was pretty staid, the prayers rote, the hymns .... well let's say they were what hymns are supposed to be - hymny. When Fr. Miguel brought his "happy band of Christians" into our church things began to change. Slowly at first, causing a bit of grumbling. Eventually the grumblers went other places and we're left with an Anglo/Hispanic, hand-waving, praise-singing, tamborine-shaking, incense-spreading, liturgical dancing, drum-beating, music-loving, spirit-filled congregation. The service is the same. The prayers are the same. Some of the hymns are the same. But, I've got to believe God is way more impressed with our joyful noise than before. If someone had told me years ago, when I knelt next to my mother, white gloved hands folded in prayer, and a doily on my head, that I'd turn into a hand-waver I'd have said it was not possible. Church, I thought for a long time, was about being quiet, reverent, deeply devout. I'm glad to know different. Sitting in the back I'm able to see God in unexpected places. Like today. I watched as a father reached down, and, wiping the bangs away from her eyes, touched his daughter's head. No big deal, right? An ordinary touch that lasted maybe 30 seconds. This particular father is not a tall guy but a big one. He has muscles that would make Popeye's biceps look like a string beans. His arms strained the seam of his T-shirt. His hands looked like bear paws. In other words, he is B-I-G. His daughter is tiny by comparison. Feeling unhappy, or not-so-good, made her appear smaller than her normal self. It wasn't the touch that caught my eye, as much as the tenderness with which it was given. I won't tell you I had a holy vision, but I did feel my eyes open in a spiritual way. This may be too woo woo for you, but I imagined that large, powerful hand to be like hand of God reaching down from heaven to gently, tenderly, lovingly touch the head of one of His children. I've felt that touch on occasion. I've often said if God wants to get my attention maybe He should write me a message in big neon letters in the sky. [I know, I know. I need to be careful what I ask for!] I've learned, instead, that Holy messages come a) when I least expect them and b) in a way I never would have guessed. I had trouble waking up this morning. Didn't really feel like getting dressed and going to church. I slid into a pew in the back, on Hispanic time ... late. I probably should have been paying more attention to the Gospel reading today. But then I might have missed the quiet, unassuming message that I'm prideful enough to think was meant for me. Good to see you finally made it. The "good news" is that I'm with you, wherever you are. Especially right now. At this time. In this place. When you leave today, don't be afraid to touch people. Be tender even if you don't always feel it. When all else fails love. Then love some more. That's really what church is all about isn't it? Being touched by God and carrying the majesty of that touch out into the world. I wish for you God's hand on your shoulder. P.S. Merry, that rainbow yesterday? That was Me too. Keep looking. You'll keep finding me.